We spent our first full day on Iceland looking around Reykjavik. For reasons known only to themselves, the company we booked our self-drive trip through booked us into accommodation 40 minutes out of town so it was a bit of a drive back. I was still sick so, while I was glad that it was a bright, sunny day, I was also not feeling my best and my eyes were watering the whole time from the blinding brightness of the near-arctic sun. First stop, after immediately finding a park right where we wanted for the first time since leaving Australia, was Harpa, the very new and shiny entertainment/conference venue in the middle of town. I’d seen pictures of it in the inflight magazine on the way over and thought to take a look. 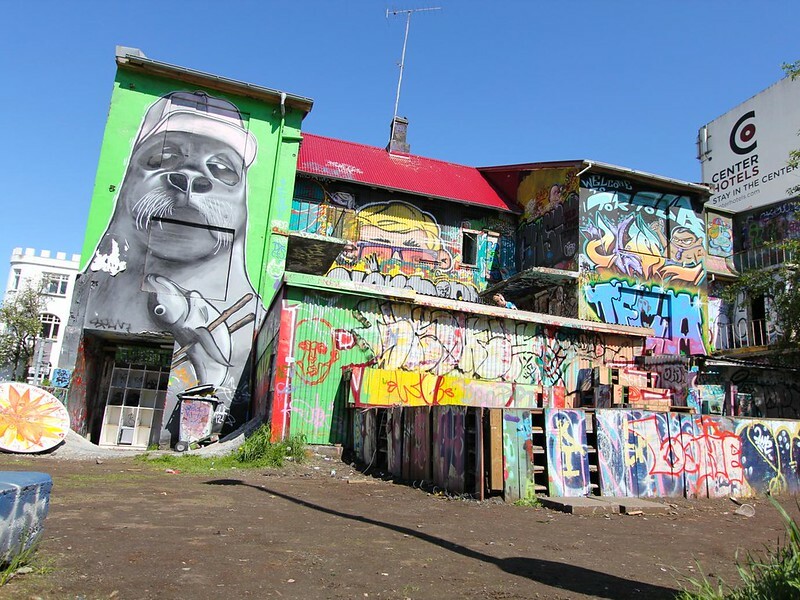 Fortunately nothing in Reykjavik is outside of walking distance, so we found it in moments and went inside to take a look. It was like I’d imagine bees would do large scale architecture. 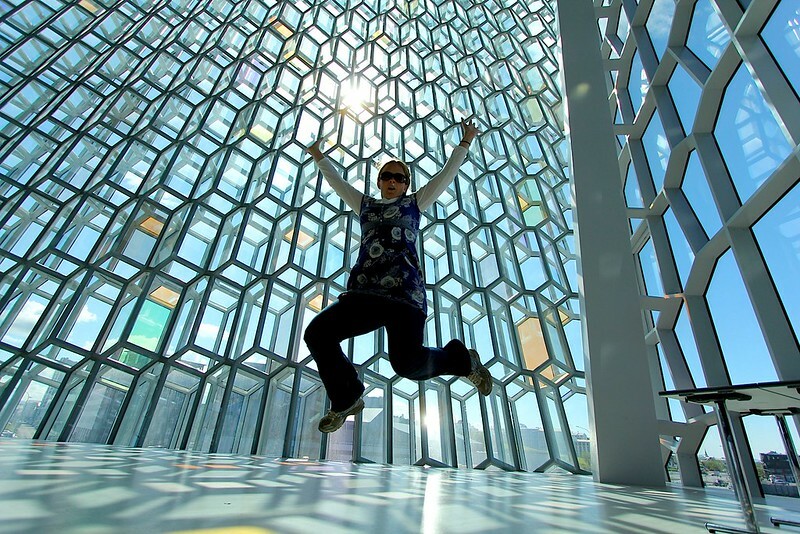 Reykjavik’ll make you… jump, jump! Then we wandered around town and found a fantastic little skate park full of great graffiti. Later on in the day we walked past again and it was full of families of all ages plus young people in groups hanging out and being a bit rowdy. Everyone around town just seemed to want to be outside in the sun. We walked over to Roadhouse Burgers, which I’d recommend if you’re not on a budget (heck, I wouldn’t recommend Iceland if you’re on a tight budget) because it was definitely the best meal we’ve eaten so far. 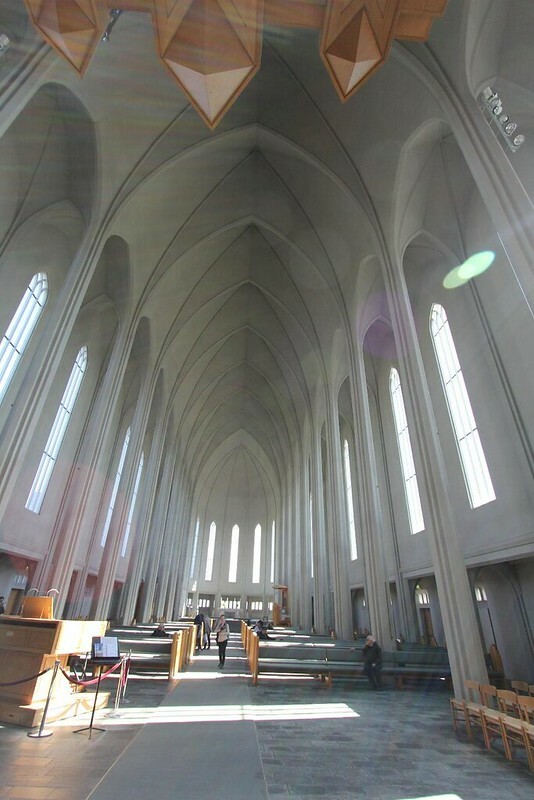 Then it was up to Iceland’s most recognisable piece of architecture, their very modern Lutheran church. 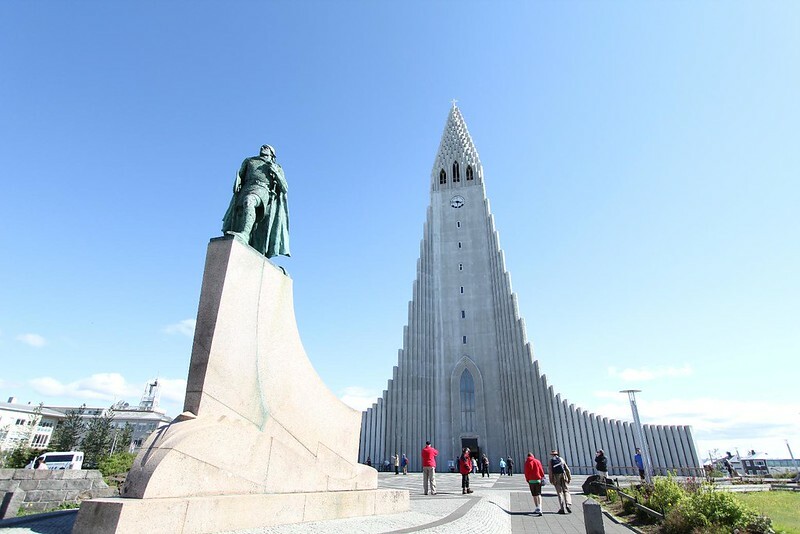 The rocket-shaped church with a statue of Leif Erikson in front, a gift from the USA to the ‘original discoverer’ of America. Except for all those pesky native people, of whom Leif himself wrote upon his return to Iceland. You’ll have to forgive me regarding the paucity of photos at the moment. The internet is slooooow anywhere outside the capital and we haven’t even been able to connect the last few days. The church looks cool but the inside is as bare as the outside and, after all the gilt and marble of other European churches, it looks sort of unfinished. Maybe needs some paint rather than the bare concrete, I don’t know. Next we walked down the hill to a bar that had been recommended by a friend of a friend – ‘Lebowski’s’ and of course all the decor was movie themed. It was a bit cheesy but we had a drink anyhow and gave our feet a rest. The final thing on my to do list for the day was look at some Icelandic wool stuff, even just buy a couple of balls of wool and some needles to keep me occupied. Well. Wool here is nasty, nasty stuff. The locals seem to take great pride in it but I couldn’t feel much difference between the wool jumpers and one of those coir doormats. Blurgh. We spent the last couple of hours before the show we’d plan to see in the evening, sitting in the foyer of Harpa on a couch is the sun reading our kindles. The show Luke had found out about was a one hour, one person history of Iceland, performed in the back room of a pub. And we were the only audience, which wasn’t as weird as you’d think, especially after we had a chat with the girl performing it. The show was pretty good, too, although there were a few slow bits. Thanks to my reading a history of Iceland before we came I already knew a fair bit of it but being able to ask questions afterwards was helpful. I was most interested in hearing about the traditional turf houses and the way in which people lived before modern times. I was told that the last people to move out of turf houses (which mostly had no electricity or plumbing) did so around the 60’s and 70’s. Which meant that there might still be people alive today who transitioned from what was, essentially, a medieval lifestyle to one that involved cars, microwaves and the internet. This boggles my mind in so many ways and I’m not even sure why I find it so enthralling. I think it reminds me of that 80’s movie, Encino Man and how I always wished I could be there to see how someone from the past reacted to all the changes that have occurred over the last X centuries. Either that or I could travel into the future and boggle at what has become of the human race. I guess travel is a bit like that. You see people living in the technological past and also in elements of the future. You see inventions that amaze you and conditions that appall you. It certainly makes every day interesting.